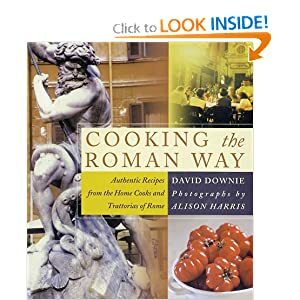 Rome has long been recognized as one of the “culinary capitals” of the world. The city boasts too many restaurants to keep track of, and the majority of them are very good. Rome is a cosmopolitan city, with many different types of cuisine available. However, each region in Italy has its own distinctive style of cuisine, and Rome is no exception. No visit to Rome is truly complete without sampling some of the regional delicacies. So, instead of settling for generic “Italian” food, try some of these enticing local specialties! There are several different regional variations on this dish, with each region claiming its own version is the “authentic” one. However, all pasta amatriciana dishes start with one key ingredient: guanciale, pig jowl that has been cured without smoke. American versions of this dish tend to substitute something else (bacon, ham, or pancetta) for the guanciale, as it is very difficult to obtain on this side of the pond. However, it’s the flavor of this particular cut of meat, with its rich, silky texture and succulent flavor, that makes the dish what it is. The “Roman” version of the dish includes tomatoes, pasta (usually spaghetti or bucatini), onions, and Pecorino cheese. The rich flavor of the pork combines with the tomatoes and the sharp, salty cheese to create a symphony of flavor. Roughly translated, the name of this classic Roman dish means “jumps in the mouth.” Try it, and you’ll see why! Tender veal slices are topped with slices of salty prosciutto, a type of Italian ham, and pungent, earthy fresh sage. Then, the veal is sautéed in butter and served topped with wine sauce. This Italian version of egg-drop soup is popular in other regions of Italy, but it usually referred to outside of Rome as Stracciatella alla Romana to indicate its Roman origins. Stracciatella is a light and refreshing soup that consists of eggs beaten to a golden froth with either parmesan or pecorino cheese, and seasoned with salt, pepper and nutmeg. The eggs are poured into bubbling chicken broth and stirred, producing delicate swirls of cooked egg. The strands of egg resemble old rags floating in the broth. Since the Italian word for rags is straccetti (and the earlier root is from Italian stracciato, “torn apart”), this resemblence is what gives the dish its name. The type of pasta used in this dish can vary-sometimes spaghetti, sometimes linguini, sometimes bucatini. However, the sauce is always the same-a heavenly mixture of guanciale, eggs, an aged cheese such as pecorino or parmesan butter, and garlic. This dish is relatively simple to make-the pork is fried first, and then it is tossed along with the other ingredients into piping hot pasta, melting the cheese and cooking the eggs so that they coat the noodles. Partially because of its simplicity, it is thought to have been created by foresters working in the Apennine Mountains — the recipe could be easily cooked over charcoal fires, or carbonara. Another local legend states that it was invented for American soldiers after World War II, who puzzled local chefs by ordering eggs, bacon and spaghetti. Still another theory is that it got its name because the specks of bacon and pepper look like bits of charcoal. Whatever its origins, it’s great! And it proves that food doesn’t have to be complicated to be good. Romans love fresh artichokes, and this is one of the preferred ways of preparing them, a name that translates as “artichokes Jewish style”. The artichoke is first trimmed of all its spikes and tough outer leaves, then flattened between two bricks, battered and fried. The result? A tasty confection that resembles a deep-fried sunflower! The outer leaves are deliciously crispy, and the heart is soft, smooth, and flavorful.